This image taken by the Mars Reconnaissance Orbiter shows the rock debris pattern that scientists believe was left by a glacier that rose at least one kilometer from the surrounding plain and flowed into the canyon. A vanishedglacier with a mysterious calling card suggests Mars went through many ice agesin its very recent past. A freshlook at images from the Mars Reconnaissance Orbiter indicates thick glaciersmay have existed in the past 100 million years in the planet's equatorialregion, but vanished after planetarywobbles changed the climate in certain areas. "We'vegone from seeing Mars as a dead planet for three-plus billion years to one thathas been alive in recent times," said Jay Dickson, a geologist at Brown University and lead author of the study. "[The finding] haschanged our perspective from a planet that has been dry and dead to one that isicy and active." Dickson andother researchers looked at a dead-ended box canyon that slopes down into alarger valley, and discovered glacial deposits of rocks marking a glacier'sadvance heading upslope into the canyon ? something which seems physicallyimpossible. Here's howit happened, according to the team's calculations: An ice pack at least .62miles (1 kilometer) thick filled the larger valley to a height exceeding thatof the box canyon walls. Glacial ice flowed in the larger valley upstream ofthe box canyon. So when the glacier reached the box canyon, the ice actuallypushed uphill into it. When theglacier ice retreated, it left behind the mystery of the box canyon and afreshly-paved surface that suggests a recent event. "Wedon't see many craters on the glacial deposits," Dickson told SPACE.com. "That's a yardstick we can use for measuring geological age." Craters onMars, caused by meteor impacts, remain for hundreds of millions of years, andtheir prevalence in an area can, like a wrinkled face, indicate an old surface.Newer surfaces lack the multitudes of scars. The findingfurther suggests that Mars has endured repeated periods of glacial activityinstead of just one single event, Dickson said, whose new work on this topic isdetailed in the May issue of the journal Geology. 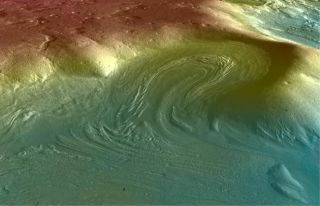 The pastpresence of glaciers could also spark further debate about whether waterflowed recently on Mars, given that pressure from the weight of glacierscan melt ice. However, no direct evidence of recent flowing water has beenfound. "Wedon't yet see evidence for melt water at this location, but the fact that therewas so much ice here expands our understanding of how active Mars climate hasbeen," said Dickson.